To all Army, corps, divisional and regimental Committees, to all Soviets of Workers’, Soldiers’ and Peasants’ Deputies, to all, all, all. 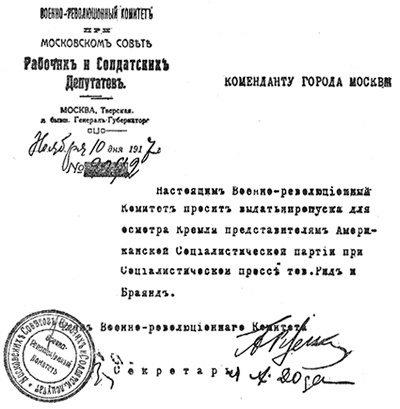 Conforming to the agreement between the Cossacks, yunkers, soldiers, sailors and workers, it has been decided to arraign Alexander Feodorvitch Kerensky before a tribunal of the people. We demand that Kerensky be arrested, and that he be ordered, in the name of the organisations hereinafter mentioned, to come immediately to Petrograd and present himself to the tribunal. The Cossacks of the First Division of Ussuri Cavalry; the Committee of Yunkers of the Petrograd detachment of Franc-Tireurs; the delegate of the Fifth Army. The Committee for Salvation, the Duma, the Central Committee of the Socialist Revolutionary party—proudly claiming Kerensky as a member—all passionately protested that he could only be held responsible to the Constituent Assembly. On the evening of November 16th I watched two thousand Red Guards swing down the Zagorodny Prospekt behind a military band playing the Marseillaise—and how appropriate it sounded—with blood-red flags over the dark ranks of workmen, to welcome home again their brothers who had defended “Red Petrograd.” In the bitter dusk they tramped, men and women, their tall bayonets swaying; through streets faintly lighted and slippery with mud, between silent crowds of bourgeois, contemptuous but fearful…. All were against them—business men, speculators, investors, land-owners, army officers, politicians, teachers, students, professional men, shop-keepers, clerks, agents. The other Socialist parties hated the Bolsheviki with an implacable hatred. On the side of the Soviets were the rank and file of the workers, the sailors, all the undemoralised soldiers, the landless peasants, and a few—a very few—intellectuals…. From the farthest corners of great Russia, whereupon desperate street-fighting burst like a wave, news of Kerensky’s defeat came echoing back the immense roar of proletarian victory. Kazan, Saratov, Novgorod, Vinnitza—where the streets had run with blood; Moscow, where the Bolsheviki had turned their artillery against the last strong-hold of the bourgeoisie—the Kremlin. Nothing that the Bolsheviki had done could compare with this fearful blasphemy in the heart of Holy Russia. To the ears of the devout sounded the shock of guns crashing in the face of the Holy Orthodox Church, and pounding to dust the sanctuary of the Russian nation…. I have just been informed, by people arriving from Moscow, what has happened there. The Cathedral of St. Basil the Blessed, the Cathedral of the Assumption, are being bombarded. The Kremlin, where are now gathered the most important art treasures of Petrograd and of Moscow, is under artillery fire. There are thousands of victims. The fearful struggle there has reached a pitch of bestial ferocity. What is left? What more can happen? I cannot bear this. My cup is full. I am unable to endure these horrors. It is impossible to work under the pressure of thoughts which drive me mad! That is why I am leaving the Council of People’s Commissars. 1. The Committee of Public Safety ceases to exist. 2. The White Guard gives up its arms and dissolves. The officers retain their swords and regulations side-arms. In the Military Schools are retained only the arms necessary for instruction; all others are surrendered by the yunkers. The Military Revolutionary Committee guarantees the liberty and inviolability of the person. 3. To settle the question of disarmament, as set forth in section 2, a special commission is appointed, consisting of representatives from all organisations which took part in the peace negotiations. 4. From the moment of the signature of this peace treaty, both parties shall immediately give order to cease firing and halt all military operations, taking measures to ensure punctual obedience to this order. 5. At the signature of the treaty, all prisoners made by the two parties shall be released…. For two days now the Bolsheviki had been in control of the city. The frightened citizens were creeping out of their cellars to seek their dead; the barricades in the streets were being removed. Instead of diminishing, however, the stories of destruction in Moscow continued to grow…. And it was under the influence of these fearful reports that we decided to go there. Petrograd, after all, in spite of being for a century the seat of Government, is still an artificial city. Moscow is real Russia, Russia as it was and will be; in Moscow we would get the true feeling of the Russian people about the Revolution. Life was more intense there. For the past week the Petrograd Military Revolutionary Committee, aided by the rank and file of the Railway Workers, had seized control of the Nicolai Railroad, and hurled trainload after trainload of sailors and Red Guards southwest…. We were provided with passes from Smolny, without which no one could leave the capital…. When the train backed into the station, a mob of shabby soldiers, all carrying huge sacks of eatables, stormed the doors, smashed the windows, and poured into all the compartments, filling up the aisles and even climbing onto the roof. Three of us managed to wedge our way into a compartment, but almost immediately about twenty soldiers entered…. There was room for only four people; we argued, expostulated, and the conductor joined us—but the soldiers merely laughed. Were they to bother about the comfort of a lot of boorzhui (bourgeois)? We produced the passes from Smolny; instantly the soldiers changed their attitude. With polite and friendly apologies the soldiers began to leave. Shortly afterward we heard them breaking into a compartment occupied by two stout, well-dressed Russians, who had bribed the conductor and locked their door…. About seven o’clock in the evening we drew out of the station, an immense long train drawn by a weak little locomotive burning wood, and stumbled along slowly, with many stops. The soldiers on the roof kicked with their heels and sang whining peasant songs; and in the corridor, so jammed that it was impossible to pass, violent political debates raged all night long. Occasionally the conductor came through, as a matter of habit, looking for tickets. He found very few except ours, and after a half-hour of futile wrangling, lifted his arms despairingly and withdrew. The atmosphere was stifling, full of smoke and foul odours; if it hadn’t been for the broken windows we would doubtless have smothered during the night. In the morning, hours late, we looked out upon a snowy world. It was bitter cold. About noon a peasant woman got on with a basket-full of bread-chunks and a great can of luke warm coffee-substitute. From then on until dark there was nothing but the packed train, jolting and stopping, and occasional stations where a ravenous mob swooped down on the scantily-furnished buffet and swept it clean…. At one of these halts I ran into Nogin and Rykov, the seceding Commissars, who were returning to Moscow to put their grievances before their own Soviet, and further along was Bukharin, a short, red-bearded man with the eyes of a fanatic—“more Left than Lenin,” they said of him…. Then the three strokes of the bell and we made a rush for the train, worming our way through the packed and noisy aisle…. A good-natured crowd, bearing the discomfort with humorous patience, interminably arguing about everything from the situation in Petrograd to the British Trade-Union system, and disputing loudly with the few boorzhui who were on board. Before we reached Moscow almost every car had organised a Committee to secure and distribute food, and these Committees became divided into political factions, who wrangled over fundamental principles…. The station at Moscow was deserted. We went to the office of the Commissar, in order to arrange for our return tickets. He was a sullen youth with the shoulder-straps of a Lieutenant; when we showed him our papers from Smolny, he lost his temper and declared that he was no Bolshevik, that he represented the Committee of Public Safety…. It was characteristic—in the general turmoil attending the conquest of the city, the chief railway station had been forgotten by the victors…. In the centre of the town the snow-piled streets were quiet with the stillness of convalescence. Only a few arc-lights were burning, only a few pedestrians hurried along the side-walks. An icy wind blew from the great plain, cutting to the bone. At the first hotel we entered an office illuminated by two candles. We dined at a vegetarian restaurant with the enticing name, “I Eat Nobody,” and Tolstoy’s picture prominent on the walls, and then sallied out into the streets. The headquarters of the Moscow Soviet was in the palace of the former Governor-General, an imposing white building fronting Skobeliev Square. Red Guards stood sentry at the door. At the head of the wide, formal stairway, whose walls were plastered with announcements of committee-meetings and addresses of political parties, we passed through a series of lofty ante-rooms, hung with red-shrouded pictures in gold frames, to the splendid state salon, with its magnificent crystal lustres and gilded cornices. A low-voiced hum of talk, underlaid with the whirring bass of a score of sewing machines, filled the place. Huge bolts of red and black cotton cloth were unrolled, serpentining across the parqueted floor and over tables, at which sat half a hundred women, cutting and sewing streamers and banners for the Funeral of the Revolutionary Dead. The faces of these women were roughened and scarred with life at its most difficult; they worked now sternly, many of them with eyes red from weeping…. The losses of the Red Army had been heavy. At a desk in one corner was Rogov, an intelligent, bearded man with glasses, wearing the black blouse of a worker. He invited us to march with the Central Executive Committee in the funeral procession next morning…. Union, and a Commissar of the Military Revolutionary Committee during the fighting…. From him I learned many details of the bloody six-day battle which had rent Moscow in two. Unlike in Petrograd, in Moscow the City Duma had taken command of the yunkers and White Guards. Rudnev, the Mayor, and Minor, president of the Duma, had directed the activities of the Committee of Public Safety and the troops. Riabtsev, Commandant of the city, a man of democratic instincts, had hesitated about opposing the Military Revolutionary Committee; but the Duma had forced him…. It was the Mayor who had urged the occupation of the Kremlin; “They will never dare fire on you there,” he said…. One garrison regiment, badly demoralised by long inactivity, had been approached by both sides. The regiment held a meeting to decide what action to take. Resolved, that the regiment remain neutral, and continue its present activities—which consisted in peddling rubbers and sunflower seeds! Vivid little pictures he gave me. On a cold grey day he had stood at a corner of the Nikitskaya, which was swept by blasts of machine-gun fire. A throng of little boys were gathered there—street waifs who used to be newsboys. Shrill, excited as if with a new game, they waited until the firing slackened, and then tried to run across the street…. Many were killed, but the rest dashed backward and forward, laughing, daring each other…. Late in the evening I went to the Dvorianskoye Sobranie—the Nobles’ Club—where the Moscow Bolsheviki were to meet and consider the report of Nogin, Rykov and the others who had left the Council of People’s Commissars. The meeting-place was a theatre, in which, under the old ré#233;gime, to audiences of officers and glittering ladies, amateur presentations of the latest French comedy had once taken place. At first the place filled with the intellectuals—those who lived near the centre of the town. Nogin spoke, and most of his listeners were plainly with him. It was very late before the workers arrived; the working-class quarters were on the outskirts of the town, and no street-cars were running. But about midnight they began to clump up the stairs, in groups of ten or twenty—big, rough men, in coarse clothes, fresh from the battle-line, where they had fought like devils for a week, seeing their comrades fall all about them. Scarcely had the meeting formally opened before Nogin was assailed with a tempest of jeers and angry shouts. In vain he tried to argue, to explain; they would not listen. He had left the Council of People’s Commissars; he had deserted his post while the battle was raging. As for the bourgeois press, here in Moscow there was no more bourgeois press; even the City Duma had been dissolved. Bukharin stood up, savage, logical, with a voice which plunged and struck, plunged and struck…. Him they listened to with shining eyes. Resolution, to support the action of the Council of People’s Commissars, passed by overwhelming majority. So spoke Moscow…. of the Kremlin. The church of Vasili Blazheiny loomed fantastic, its bright-coloured, convoluted and blazoned cupolas vague in the darkness. There was no sign of any damage…. Along one side of the square the dark towers and walls of the Kremlin stood up. On the high walls flickered redly the light of hidden flames; voices reached us across the immense place, and the sound of picks and shovels. We crossed over. Mountains of dirt and rock were piled high near the base of the wall. Climbing these we looked down into two massive pits, ten or fifteen feet deep and fifty yards long, where hundreds of soldiers and workers were digging in the light of huge fires. So, all the long night volunteers of the People relieved each other, never halting in their driving speed, and the cold light of the dawn laid bare the great Square, white with snow, and the yawning brown pits of the Brotherhood Grave, quite finished. We rose before sunrise, and hurried through the dark streets to Skobeliev Square. In all the great city not a human being could be seen; but there was a faint sound of stirring, far and near, like a deep wind coming. In the pale half-light a little group of men and women were gathered before the Soviet headquarters, with a sheaf of gold-lettered red banners—the Central Executive Committee of the Moscow Soviets. It grew light. From afar the vague stirring sound deepened and became louder, a steady and tremendous bass. The city was rising. We set out down the Tverskaya, the banners flapping overhead. The little street chapels along our way were locked and dark, as was the Chapel of the Iberian Virgin, which each new Tsar used to visit before he went to the Kremlin to crown himself, and which, day or night, was always open and crowded, and brilliant with the candles of the devout gleaming on the gold and silver and jewels of the ikons. Now, for the first time since Napoleon was in Moscow, they say, the candles were out. The Holy Orthodox Church had withdrawn the light of its countenance from Moscow, the nest of irreverent vipers who had bombarded the Kremlin. Dark and silent and cold were the churches; the priests had disappeared. There were no popes to officiate at the Red Burial, there had been no sacrament for the dead, nor were any prayers to be said over the grave of the blasphemers. Tikhon, Metropolitan of Moscow, was soon to excommunicate the Soviets…. Also the shops were closed, and the propertied classes stayed at home—but for other reasons. This was the Day of the People, the rumour of whose coming was thunderous as surf…. Already through the Iberian Gate a human river was flowing, and the vast Red Square was spotted with people, thousands of them. I remarked that as the throng passed the Iberian Chapel, where always before the passerby had crossed himself, they did not seem to notice it…. We forced our way through the dense mass packed near the Kremlin wall, and stood upon one of the dirt-mountains. Already several men were there, among them Muranov, the soldier who had been elected Commandant of Moscow—a tall, simple-looking, bearded man with a gentle face. A bitter wind swept the Square, lifting the banners. Now from the far quarters of the city the workers of the different factories were arriving, with their dead. They could be seen coming through the Gate, the blare of their banners, and the dull red—like blood—of the coffins they carried. These were rude boxes, made of unplaned wood and daubed with crimson, borne high on the shoulders of rough men who marched with tears streaming down their faces, and followed by women who sobbed and screamed, or walked stiffly, with white, dead faces. Some of the coffins were open, the lid carried behind them; others were covered with gilded or silvered cloth, or had a soldier’s hat nailed on the top. There were many wreaths of hideous artificial flowers…. Through an irregular lane that opened and closed again the procession slowly moved toward us. Now through the Gate was flowing an endless stream of banners, all shades of red, with silver and gold lettering, knots of crepe hanging from the top—and some Anarchist flags, black with white letters. The band was playing the Revolutionary Funeral March, and against the immense singing of the mass of people, standing uncovered, the paraders sang hoarsely, choked with sobs…. Slowly the marchers came with their coffins to the entrance of the grave, and the bearers clambered up with their burdens and went down into the pit. Many of them were women—squat, strong proletarian women. Behind the dead came other women—women young and broken, or old, wrinkled women making noises like hurt animals, who tried to follow their sons and husbands into the Brotherhood Grave, and shrieked when compassionate hands restrained them. The poor love each other so! All the long day the funeral procession passed, coming in by the Iberian Gate and leaving the Square by way of the Nikolskaya, a river of red banners, bearing words of hope and brotherhood and stupendous prophecies, against a back-ground of fifty thousand people,—under the eyes of the world’s workers and their descendants forever…. One by one the five hundred coffins were laid in the pits. Dusk fell, and still the banners came drooping and fluttering, the band played the Funeral March, and the huge assemblage chanted. In the leafless branches of the trees above the grave the wreaths were hung, like strange, multi-coloured blossoms. Two hundred men began to shovel in the dirt. It rained dully down upon the coffins with a thudding sound, audible beneath the singing…. The lights came out. The last banners passed, and the last moaning women, looking back with awful intensity as they went. Slowly from the great Square ebbed the proletarian tide…. I suddenly realised that the devout Russian people no longer needed priests to pray them into heaven. On earth they were building a kingdom more bright than any heaven had to offer, and for which it was a glory to die…. Damage To The Kremlin I myself verified the damage to the Kremlin, which I visited immediately after the bombardment. The Little Nicolai Palace, a building of no particular importance, which was occupied occasionally by receptions of one of the Grand Duchesses, had served as barracks for the yunkers. It was not only bombarded, but pretty well sacked; fortunately there was nothing in it of particular historical value. Usspensky Cathedral had a shell-hole in one of the cupolas, but except for a few feet of mosaic in the ceiling, was undamaged. The frescoes on the porch of Blagovestchensky Cathedral were badly damaged by a shell. Another shell hit the corner of Ivan Veliki. Tchudovsky Monastery was hit about thirty times, but only one shell went through a window into the interior, the others breaking the brick window-moulding and the roof cornices. The clock over the Spasskaya Gate was smashed. Troitsky Gate was battered, but easily reparable. One of the lower towers had lost its brick spire. The church of St. Basil was untouched, as was the great Imperial Palace, with all the treasures of Moscow and Petrograd in its cellar, and the crown jewels in the Treasury. These places were not even entered. Lunatcharsky’s Declaration “Comrades! You are the young masters of the country, and although now you have much to do and think about, you must know how to defend your artistic and scientific treasures. “Comrades! That which is happening at Moscow is a horrible, irreparable misfortune…. The People in its struggle for the power has mutilated our glorious capital. “It is particularly terrible in these days of violent struggle, of destructive warfare, to be Commissar of Public Education. Only the hope of the victory of Socialism, the source of a new and superior culture, brings me comfort. On me weighs the responsibility of protecting the artistic wealth of the people…. Not being able to remain at my post, where I had no influence, I resigned. My comrades, the other Commissars, considered this resignation inadmissible. I shall therefore remain at my post…. And moreover, I understand that the damage done to the Kremlin is not as serious as has been reported…. “But I beg you, comrades, to give me your support…. Preserve for yourselves and your descendants the beauty of our land; be the guardians of the property of the People. 1. All banks with branches, the Central State Savings Bank with branches, and the savings banks at the Post and Telegraph offices are to be opened beginning November 22nd, from 11 A. M. to 1 P. M. until further order. 2. On current accounts and on the books of the savings banks, payments will be made by the above mentioned institutions, of not more than 150 rubles for each depositor during the course of the next week. 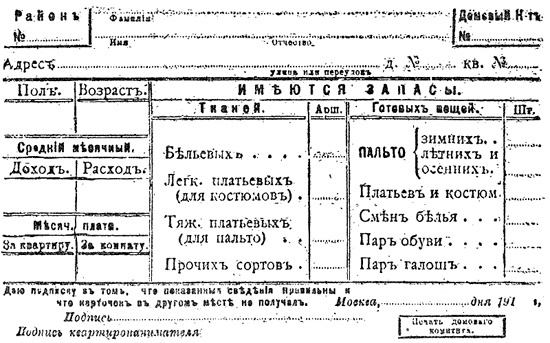 (b) For the payment of salaries of employees and the earnings of workers according to the tables and lists certified by the Factory Committees or Soviets of Employees, and attested by the signatures of the Commissars, or the representatives of the Military Revolutionary Committee, and the district Military Revolutionary Committees. 4. Not more than 150 rubles are to be paid against drafts; the remaining sums are to be entered on current account, payments on which are to be made in the order established by the present decree. 5. All other banking operations are prohibited during these three days. 6. The receipt of money on all accounts is allowed for any amount. 7. The representatives of the Finance Council for the certification of the authorisations indicated in clause 3 will hold their office in the building of the Stock Exchange, Ilyinka Street, from 10 A. M. to 2 P. M.
8. The Banks and Savings Banks shall send the totals of daily cash operations by 5 P. M. to the headquarters of the Soviet, Skobeliev Square, to the Military Revolutionary Committee, for the Finance Council. 9. All employees and managers of credit institutions of all kinds who refuse to comply with this decree shall be responsible as enemies of the Revolution and of the mass of the population, before the Revolutionary Tribunals. Their names shall be published for general information. 10. For the control of the operations of Branches of the Savings Banks and Banks within the limits of this decree, the district Military Revolutionary Committees shall elect three representatives and appoint their place of business.